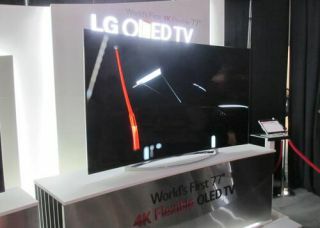 LG reveals 77in flexible OLED TV at CES 2014 | What Hi-Fi? Claiming a world's first, though we've also seen a Samsung flexible TV, the angle of the curve on the LG flexible OLED TV can be controlled by the viewer. Not content with just being a bendy OLED, it's also of course a 4K TV. Promising "the ultimate viewing experience", the curvature can be altered by remote control to suit your own preferences, though it's not entirely clear what those might be. Our experiences with curved screens, such as the Samsung curved OLED TV, suggest a curve works well if you're in the sweetspot, but not so well for anyone else in the room. We shall see. LG says the TV has been subjected to thousands of hours of test to ensure it can go from flat to curved without breaking under the strain. There's no word on pricing, release dates or indeed official confirmation of a retail release but it's certainly an impressive flag in the sand.